Uses clip from Wall-E and two science articles about garbage mountains and trash islands to compare and contrast a fictional dystopian society covered in garbage, and present day Earth. 21 Listening Comprehension Questions in chronological order for the film Wall-E from Pixar. Excellent for the unit: AP Spanish Science and Technology. La ciencia y la tecnología. 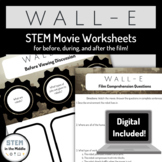 Notes and activities for the study of Wall E directed by Andrew Stanton. Links to relevant websites are included along with apps and websites that can be used to complete activities. For use in a 1:1 device classroom. Sociology students will view the movie Wall-E and answer questions about Wall-E and socialization. 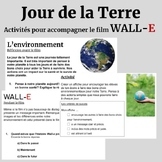 Wall-e Earth Day activity package en Français! You will need the movie Wall-E. This is a good filler of time AND a great discussion with students after movie.